As the name suggests, a spotting scope is an optical instrument designed solely for the purpose of detecting and watching terrestrial objects. In optical terms, a spotting scope is a highly powered telescope with added features of optics to present an erect image. The final image is optimized for terrestrial viewing, these instruments are brought in use at the time of bird-watching, hunting, ranging, surveillance or other natural in-land activities. As a matter of fact, these spotting scopes have much more magnification power than a pair of binoculars and are therefore put to use where binoculars fail, typically of the order of 20x to 60x. Just like the international market of binoculars, the spotting scopes have a multitude of manufacturers varying on their brand name and brand value. One such brand name which is closely knitted to the world of optics is ‘Vortex’. An American Company, Vortex Optics first came into being in 2004 and ever since then it has been striving hard to be a tough competitor to the already established market owners, Nikon and Bushnell to name two. The company deals in manufacturing of optical instruments like binoculars, spotting scopes, riflescopes and other optical instruments. In this article, we will review the best vortex spotting scope available online. Like the other optical instruments, spotting scopes to have basic architectural features like an objective lens, eyepiece etc. Additionally, it also has a refracting objective lens to erect the images. The light gathering power and resolution of a spotting scope is spot on with very less deviation. What to look for in the best Vortex spotting scope? All vortex spotting scope features are one of a kind and form the USP of the brand products, exclusive to the product they are being featured in. Yet there are certain features that despite being exclusive to the ‘Vortex Banner’ are common to all products falling in line. Having said this, here is a detailed description of what one must look for in best vortex spotting scopes. One common thing to all vortex products of all range, from the cheapest to the costliest is that there is a substantial use of coatings on every air-to-glass surface. This proprietary coating ensures that the instrument is capable of gathering maximum light from the atmosphere. This unparalleled power of gathering maximum light empowers the device to achieve higher magnifications even under low light conditions without compromising with the quality of the image captured. The common spotting scopes come with lower end roof prisms. The scopes based on this technology are known to perform comparatively okay. As a matter of fact, these end roof prisms do not allow total internal reflection to occur smoothly and perfectly, which in turn means that the image quality produced by the device is hampered in terms of brightness and contrast. A typical ‘Vortex’ solution to this problem is that it uses multiple layers of dielectric coatings. These multiple layers of coating ensure that the fidelity of image is not compromised by the prisms devised inside the scopes. This feature, like others mentioned, remains common to all scopes under the banner of the company, irrespective of their price range. Being an outdoor instrument, it is likely that the scopes would be used under all conditions varying from mild to harsh. Therefore, to make an instrument stand out under all weather conditions it is important for it to be weather resistant. To ensure utmost water resistivity, all Vortex products are O-ring sealed. This sealing of the instrument keeps moisture, fluids, small debris at bay from the delicate inner functionaries. Furthermore, to ensure that there is absolutely no internal fogging, a result of any reminiscents of moisture or any fluid over a range of temperature, the internals of the devices are purged with either Nitrogen or Argon, depending on the end cost of the product. For higher-end offerings, dry Argon is used and for lower end offerings, dry Nitrogen is used. All of these features stated above, make spotting scopes from Vortex feasible to be used under all weather circumstances without causing any potential damage to the instrument. All Spotting Scopes from Vortex, like other products from the brand comes with a lifetime warranty, without a concern regarding their varied prices. This enables customers to avail the service of repairs/replacements throughout the lifetime of the product without second thoughts. A key point of this facility is that the company is ready to serve for all sorts of defects or damages to the product without posing a single question about the same. Additionally, the policy is completely transferable, i.e. the warranty of the product can be transferred from one owner to another in case of reselling. In general, all images are composed of seven different colors all of which differ in their wavelength. Due to this reason when the visible spectrum of light diverges from the prism, chromatic aberration occurs which results in loss of color fidelity. To deal with this rising issue of color fidelity Vortex uses apochromatic lens system that focuses all light waves of different wavelengths back on one point. This color correction by the lens system deployed enables users to enjoy images with right colors and with utmost clarity, so much so that one can easily identify individual species of birds even during flight. In addition to the advance system of the apochromatic lens system, the company uses high-density glasses to obtain color correct the images. 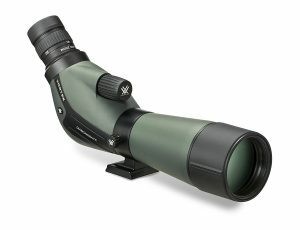 Giving to the fact that high-end spotting scopes are way more delicate and prone to damages, all such devices from Vortex feature a tough coating on their exterior lenses which keeps them unaffected by dirt, scratches and oil reminiscents, allowing the observers to get in close vicinity with nature to have a more vivid experience. Though all Vortex scopes come with XR multicoated optics to ensure maximum light transmission, yet all high-end spotting scopes come with additional XR Plus multi-coated optics. This superior coating maximizes light transmission to guarantee brighter and crisper images. As a matter of fact, these high-end scopes provide quality at par with the ultra-end $2K plus offerings from renowned brands. One must remain assured of the fact that the quality of images from the scopes remains uncompromised irrespective of the price range category. Even the least expensive products have all the features enlisted as in any high-end products. As the expense increases, there is a substantial betterment in the quality of the features provided so as to provide best within the range. The bottom line being, unlike other major brands in the market, one does not have to compromise with the image quality even when the user intends to spend comparatively less. Hence, giving best in getting least. All other scopes from the banner are majorly the variants of these three enlisted. Being cheapest scope of all from Vortex, these Diamondback scopes have scintillating features for their cost price. Having a zoom range of 20x to 60x, the scope provides a decent magnification and zooming power to the observers. Being in the bloodline of Diamondback from Vortex, this spotting scope has ample amount of features delivering outstanding performance to the observers. The scope forms a go-to choice if one desires for performance level at par in a light and compact design and at pocket-friendly cost price. Powered by a 60mm objective lens, the device encaptures sufficient amount of light from the surroundings to ensure brightness of images at all magnifications. The XR multi-coatings allow maximum light transmission hence, avoiding glare and producing maximum brightness in the images. The dielectric prism incorporated in the device makes color correction prevalent and hence producing better contrast and color in the images. In addition to this, a maximum zoom of 60x makes viewing even more vivid, clear and crisp. Since the basic architecture of the device includes O-ring seal along with purging of dry Nitrogen in the internals, the instrument remains totally waterproof and fog proof. Covered within the domains of a tough outer coating, the device has a rugged and tough covering making it resistant to environmental changes. These particular features enable the device to be used under all circumstances. This particular model comes in two variants- straight and angled. These two variants allow the users to opt for either linear field of view of the angled field of view. The device offers a 105-yard field of view at 20x magnification and a 51-yard field of view at 60x magnification, which in contrast to others in the industry is of much higher value. The eye relief range of 20-16.5 mm though is a little scanty but gets compensated with other valuable features. The device, like others from the bloodline, comes with a VIP warranty to the product, making it even more desirable. The Viper HD series from Vortex is a middle tier offering from the brand to the customers. 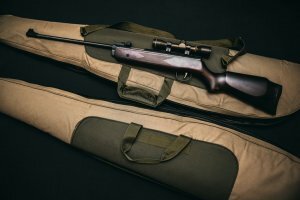 The range aims at customers who long for a device with clear long-lasting sighting with a robust and strong built so as to sustain all conditions of a rough field. The devices under this tier, apart from coming packed with XR fully multi-coated optics and multi-layer dielectric prism system as in its siblings from the lower range, come with HD lens elements. This HD lens system utilized by the scope add-on for the cost of the device majorly in comparison to its lower substitutes and marks for the improvements in the viewing experience over the Diamondback series in terms of visual fidelity, even at high magnifications up to 60x. The HD lens system ensures better color renditions for the subjects that are projected as subjects to the eye when seen from the device. Furthermore, the device uses a long objective lens of 80mm. This highly powered objective lens captures maximum possible light from the surroundings to make the images appear brighter and crisp even at maximum magnifications of 60x. Thus, maintaining the image quality. The basic architecture and the most advanced features of the device include O-ring seal along with purging of ‘superior’ Argon, which claims to provide better fog proofing but is actually nothing but a marketing stunt. The instrument remains totally waterproof, fog proof and away from all other impurities that may enter the device. Covered within the domains of a tough outer coating, the device has a rugged and tough covering making it resistant to environmental changes. These features enable the device to be used under all circumstances. Additionally, Viper HD uses ArmorTek coating around its exterior lens surfaces which protects the lens surface against dirt and scratches. This much-needed protection to the lenses adds on to the overall tough aura of the device. The Viper HD models just like the Diamondback ones come in two variants- straight body and angled body. This basic difference in the body structure of the two variants adds to the difference in their performance based on the focal length. The Razor series are the flag bearers of the Vortex banner. With excellence in all domains, ranging from external built to inner details, the Razor HD scopes are unambiguously the best buy for a person, pertaining to the fact that there is no specific limitation on the expenditure. Having a paired embodiment of ultra-high resolution, visual quality along with tough exterior built providing strong protection against tough environmental prospects. 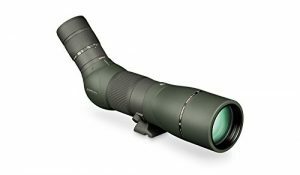 This spotting scope is the ultimate solution to a thirst for perfect spotting scope be it for any purpose- bird watching, Digiscoping, range shooting, hunting and even for low-level astronomy, making it a one-stop answer to all. 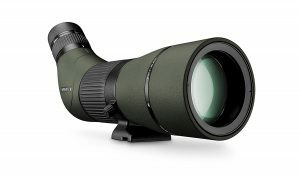 The scope provides high-end imagery with the use of XR Plus fully multi-coated optics, which is far better than what is incorporated in either Diamondback or in Viper HD. The scope also has dielectric prism coating, HD glass, and triple apochromatic lens system. To add on, the instrument also houses an objective lens of 80mm to 85mm- serving as a nitro boost to the device. According to the basic optics, the brightness of the image produced depends on the amount of light gathered, which in turn is directly proportional to the square of the objective diameter. As in Viper HD series, the Razor HD series also has an ArmorTek coating on the exterior surfaces of lenses to safeguard them from scratches, dirt, oil etc. To ensure utmost waterproofing and fog proofing, the device is O-ring sealed along with dry Argon gas purged in. The Razor HD series just like other Vortex series is available in two variants- straight bodied and angled bodied. Both of these variants work equally well and the choice solely depends on the customer depending on his use and demand. All said and done, the things worth noting and mentioning about the Vortex product is their unbeatable core performance powered by the tough exterior, great optics. The company’s motto says to learn through experience and this is what their products speak off. With limited product heir line, the Vortex banner believes in delivering the best, the unmatchable at highly affordable and competitive prices. The limited availability of choices is rather an added advantage to the customers, for it creates way less confusion as compared to other brands where there are tons of options with more or less similar features with no considerable difference between them. These features, common to all Vortex products have made them the best choice. They are the go-to brand for people of different walks with different requirements and pocket allowance, making the brand an ultimate solution to every ‘scope’ requirement.